Filipino fans have all been hoping and dreaming for a long time that British rock band Coldplay will have a concert in the country. Now they need not dream anymore, Coldplay is sure to come to the Philippines. 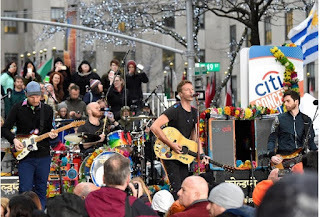 Major news websites CNN Philippines, Inquirer, and Rappler have cited from their very reliable sources that Coldplay is set to hold a concert in the Philippines this year. Before the confirmation came out on the news websites, fans have already been talking excitedly about the rumored concert on social media. CNN cited unnamed sources, one brand manager and two employees, from a leading telecommunications company, which it said is sponsoring the event. The CNN sources gave no details but confirmed that Coldplay is coming to Manila in the latter part of this year. Meanwhile, Rappler named the sponsoring company as none other than Globe Telecom and cited several sources from Globe, who have confirmed the upcoming Coldplay concert. The sources also did not give details because they have not been finalized yet. Of all the news websites, it's Inquirer that gave some details, this time coming from another source- from a top official of the supposed venue for the concert. Inquirer's source said that the promoters have booked the last week of November for the Coldplay concert at the SM Mall of Asia (MOA) Arena. BUT the booking is not final yet because the contract hasn't been signed. So there you go, Coldplay is sure to come to the Philippines for a concert. They will be performing in the last quarter of this year, most likely November. And, they will most likely perform at the SM Mall of Asia (MOA) Arena. Coldplay fans, you have about half a year to prepare for the concert. Start saving your cash for the concert tickets! Coldplay is currently touring several countries for its A Head Full of Dreams Tour. The 20-year-old band will perform in Mexico City, Mexico for the next leg of its tour on April 15.